New fabrics and colors plus the addition of the top down/bottom up operating system makes the Solera Soft Shade from Hunter Douglas an exciting Roman Shade option. A hybrid of Roman and Cellular Shades, Solera Shades offer a contemporary and upscale look at an affordable price. The top down/bottom up feature is available with the UltraGlide, EasyRise and PowerView Motorization lifting systems. 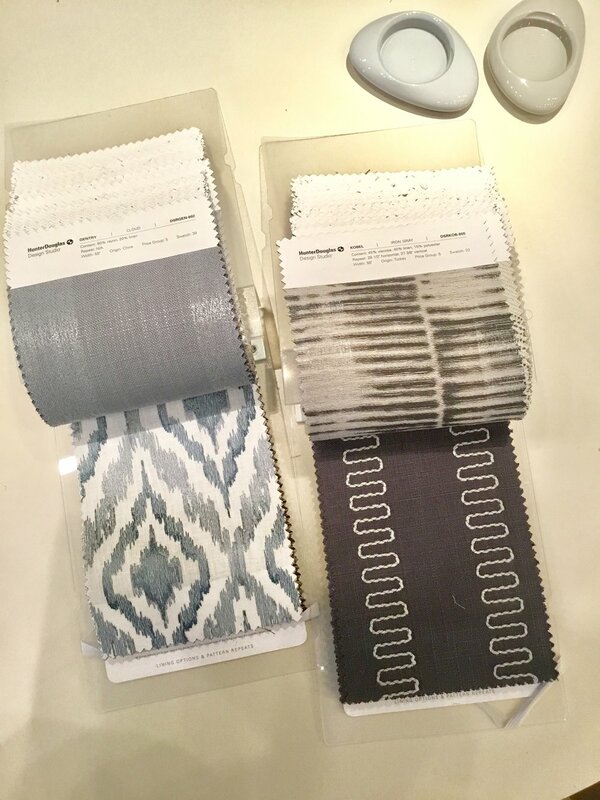 Along with this sleek feature, three new fabrics and 18 on trend colors are a hit with clients. There is a true white and a nice selection of gray tones - today's most popular interior design colors. All of these fabrics are offered in light filtering and room darkening options, making them ideal for many areas in the home. In addition to their unique style, Solera Soft Shades provide practical benefits. The cellular construction filters light while providing energy efficiency and blocking those harmful UV rays. At Hunter Douglas child and pet safety is key, so these shades were constructed with the lift cords on the inside. You can rest easy knowing that your furniture and floors are protected and your children and pets are safe. This is one of our recent installations of Solera Soft Shades in Frisco, Texas. We used the PowerView Motorization operating system and the fabric we selected was Layla in December White. It adds to the clean, soft contemporary look of the room and can easily be paired with almost any fabric for a drapery. That will be our next project. Providing Solera Soft Shades to all of these areas: Dallas, North Dallas, Plano, Carrollton, Farmers Branch, Addison, Coppell, Southlake, Denton, Keller, Roanoke, Benbrook, Westlake, Fort Worth, Lewisville, Grapevine, Trophy Club, The Colony, Frisco, Prosper, Celina, Savannah, Aubrey, McKinney, Allen, St. Paul, Wylie, Sachse, Rockwall, Rowlett, Lucas, Parker, Melissa, Anna, Fairview, Heath, Garland, Richardson, Irving, Las Colinas, University Park, Highland Park, Kessler Park, Euless, North Richland Hills, Colleyville, Flower Mound, Corinth, Arlington, Little Elm, Hurst, Saginaw, Haltom City, Bedford, Watauga, Haslet and many more!